Eat Chocolate?!! Well, if that's not the perfect advice for a Monday morning, I don't know what is! Hello everyone! I hope you all had a great weekend. We had a good one and got lots of stuff done around the house and started prepping the yard for Fall and all that good stuff. I love it when the weekend is both relaxing and productive. I even managed to get into my craft room to clean it (scary, scary job people!) and make some cards. I used the adorable Technique Tuesday set called Eat Chocolate from their Keep Calm series. You really have to go check them all out. They are soooo adorable. I've been playing with several sets and they just make me happy! Anywho....I just wanted to pop in quickly to say hello and share these cards with you. Have a GREAT day everyone.....and don't forget...Keep Calm and Eat Chocolate! August Greenhouse Society from TT - Take 2! Hey Everyone! I'm so pleased to be back with another card using the August Greenhouse Society stamp set from Technique Tuesday. I absolutely love this flower image! It makes me happy. I stamped it 3 times and then went to town colouring it in these fun, bright colours. Speaking of happy........today is shipping day! If you're a member then this awesome poppy stamp is automatically shipping to you. Not a member? Well, the good news is you can still purchase the set for a limited time....but when they are gone...they're gone. My sentiment stamp is from Favorite Memories by Ali Edwards. I can't say enough about this stamp set, also. Thank you so much for stopping by. I hope you're having a great weekend. Not much on the agenda here except going out to shop for some new eyeglasses. I know, I know....I can hardly stand the exciting life I lead! Yay, yay, yay~~~time for another Embellish Magazine colour challenge and just look at that amazing image above. LOVE IT! How can you not be inspired by it? We are SO excited to introduce you to our sponsor this week. I admit that The Stamps of Life is a new company to me but am I ever happy to have been introduced to them also. I really love their stamps and you must check out owner, Stephanie Barnard's blog. She has really fun videos introducing you to her new releases each month. You can purchase their images in the form of clear stamps or digital stamps AND they have a Stamp of the Month Club for a very reasonable price so you automatically receive the stamps each month. I am also floored that they mail stamps to Canada for $1.50 per set (to a max of 4 sets per order). That is INCREDIBLE and if you are from Canada like me you know just how great that is!! My card uses one of the most awesome cupcake stamp sets I have ever seen. It is called HappyBday2You. How much do you love that big yummy cupcake?!! It's a winner for sure. I stamped the "icing" onto embossed cardstock and trimmed it out. I stamped it again on white cardstock and layered them so it looks like a bit of the "cake" is showing. Anyone else hungry? lol. The inside of my card is finished off to complete the Happy Birthday sentiment. Thanks so much for stopping by! I hope you are truly inspired to make a Birthday themed card using the fabulous colours of the week. You will find more comprehensive details at this link at Embellish Magazine as well as the link to add your card entry. A winner will be chosen to receive their very own HappyBday2You stamp set. Enjoy! Hey Everyone. Hope you are having a great week. I want to send out a great big HAPPY BIRTHDAY to my amazing niece Shelby. She is 12 today! I cannot believe it~~~12 yrs old already. I keep telling her to stop growing up so fast. Not that I am worried it makes me older too....he he...no not that. Have a wonderful day Shelby.....I wish I was there to give you a big birthday hug! But I can't wait to see you at Christmas time! In honour of Shelby's day I made a birthday card as my Loonie Stampers card. Regan chose these HOT colours and can I tell you.......I love them! LUV!!! Can you believe that ALL of the patterned paper on this card is from my scrap folder???? Oh yeah. Same with the brown strip and kraft piece with the sentiment on it - straight out of my little paper garbage can! I was inspired by Jessica Witty's scrap card and knew I wanted to take on her 10-Minute-Scrap-Pile-Challenge. I didn't time myself to see how long it did take to make but WOW do I ever love that I actually used old product and it worked! Thanks so much for the inspiration Jessica....I hope you are going to continue with the challenges?? See my fingers crossed? Now before you go and get a start on enjoying your weekend please check out the Loonies! I had SO much fun with this challenge. Of course I had to borrow stamp sets from my wonderful, generous, amazing friends~~~ Wendy and Rho ~~~ because I had exactly ZIP NADA NOTHING for stamps that included pine-cones and acorns. Thanks girls for lending me the stamps. I *might* return them. I will think about it. For this one below I was totally in love with with greenery and pine-cones in Ashley's colour map and loved that I could (sort of) recreate it. Ashley makes THE BEST colour maps out there. Don't you agree? You are going to love the next challenge too. Stay tuned. Oh....I remembered that I had bought these chipboard-y Martha Stewart acorns last year on clearance and wanted to finally do something with them. This challenge was the perfect opportunity. They open up and you can put schtuff in them. Here's the before. Here's the after! Love it. It's glitterfied! In fact EVERYTHING in my craft room appears to be glitterfied at the moment. Hehee. Thanks for visiting today everyone. See you tomorrow with my Loonie Stampers challenge card. It's a good one! 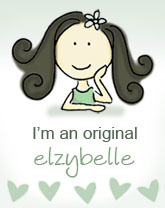 Hey Everyone.....time for a little Elzybells Challenge! This week we would love for you to play along by creating a Christmas gift or Christmas wrap. I am sure you are all knee high in Christmas projects already and we'd love to see your twist on it using your Elzybells stamps. Be sure to add your link on Elizabeth's blog for a chance to win! The stamps I used on my little gift bag are the Set of 4 robins. I think they are the cutest birds in the entire world of stamps! The sentiment can be found here. How "tweet" is that? Heehee. Did you notice the gorgeous ribbon? It's Perfectly Pretty of course and you find it here in Carly's beautiful Etsy store. It's so soft and it ties like a dream. Please check out the other DT creations. We can't wait to see yours! My very good friend Carly has opened up the most darling Etsy store and I am so proud that she asked me to be on her Design Team. I am also super excited that Sarah Martina will be part of this team with me. Sarah is also such a good friend to me and I am happy that we can share another adventure together. How fun is that?!! Carly's Etsy store will focus on gorgeous ribbon and embellishments but you will also find unique vintage-y treasures and most recently some vintage style stamps. Once you visit her Etsy store you will see that all the items are very special.....just like Carly herself! Watch for the store to grow and become your one stop shop for all things "pretty". I am sure you know Carly well and have visited her blog (so you know just how talented this girl is!) but just in case I wanted list where you can find her. It's going to be so much fun to share these wonderful ribbons and embellishments with you as I use them on my creations. Today I will start with a card I made using the most gorgeous Orange Grosgrain Striped 1.5" ribbon. ~~~It also comes in pink~~~ LOVE it! Thank you so much for stopping by and letting me share the news. Please visit Carly's blog to leave a little love and congratulate her on what I just know is going to be a wonderful success. Have a Perfectly Pretty day everyone!! P.S.....you may recall this card...I know a bunch of you LOVED the ribbon. It's also from Carly's Etsy store. Just thought I'd let ya know. Dee is the Queen of "white space". I LOVED LOVED LOVED this card she made and this is my attempt at her style. Never mind that my lines are bad and my tree is crooked.....go look at Dee's card and forget about mine. Yep I am a Dee Wannabee!